OMG, Machan, what can I say about him? His genkiness is probably able to make peace in the whole damn world! XD I love his unique voice, his 'special ability' to handle animals WAHAHA and his interest and determination for everything new! If there is an election of the most 'caring' person in JE, he will definitely rank in the top 5! great personality , superb acting and singing skill ! he stands out either he's with Arashi or he stands alone.. and eventhough his a baka , but he's a superhot-baka and no one can top him !! Genki, Kawaii and just precious. I love Aiba. He takes such wonderful photographs too. His voice is devine and is acting is impressive. I am longing to see more of him. haven't seen him in any dorama (mukodono is in my "to watch" list).. but he's very funny in PIKA**NCHI.. especially with the knitted blanket he flew with... YAY!!! Pleasant, cheerful, adorkable baka of Arashi who's full of fighting spirit and optimism. You definitely cannot get bored with this guy. ;) Aiba-chan ga suki! He's my other favourite member in Arashi. I watched him first in PPOI, than in the Pikanchi movies, and I think, he has a real talent. And he's so hot!!! First saw him in Yankee Bokou ni Kaeru and Mukodono... A very cute actor! Didn't appear in any dorama lately but love to see more of his dorama soon. he is very happy person, i loved his acting in Pikan**chi double, even though it is not a drama...plus he's an arashi member and he's sooo cool!!!! all i can say is aiba is so funny and cutea nd so adorable! !...i mean he's the center fun of everything in arashi! !..he's the funniest ever!! This guy is awesome. From comical host from variety show to serious drama character, he'll definitely have a strong career for a long time. I obviously am a bias Arashi fan. ><" His role in Yankee just does'nt seem to capture my attention much but his so baka and I like it. 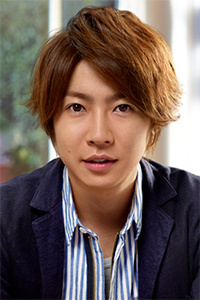 ok.aiba?hes my super favorite rite now!hes so ultimatly HOT~!!!!!!!! !luv ya forever to death! *chu*!u rock da wurld! His bakaness is unresistable. Luv him for his shyness -^.^- and cuz he's Aiba-chan himself. a cute baka guy! somehow i think he can make people around him feeling happy and cheerful! aiba is so hyper and kawaii and and and so ....cute...he's jus lyk a bear i wanna hug!!! because i love him..kawaii ne?and also bcoz i'm an arashi's fan..of course! Besides Jun I like Aiba also! he's soh daymn cool in Mukodono!! wahahhaha!